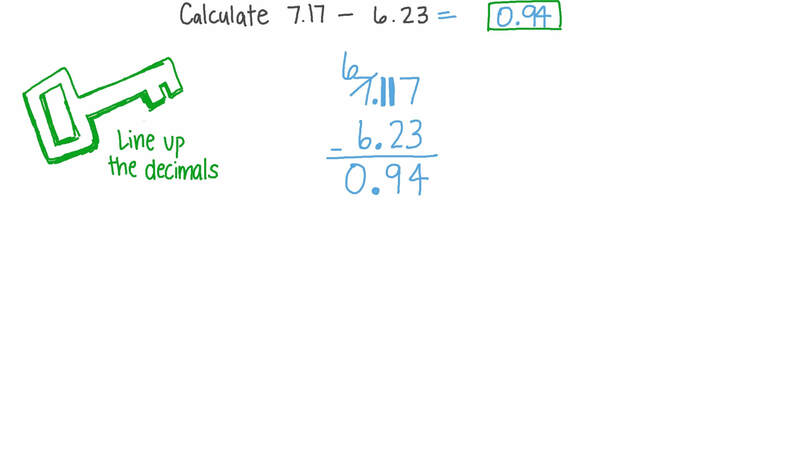 In this lesson, we will learn how to subtract two decimals using models and tables and apply this in real-life situations. Calculate 7 . 1 7 − 6 . 2 3 . Yasmine has $45 to buy chocolate. A white chocolate bar costs $3.87, and a dark chocolate bar costs $3.59. If Yasmine buys 7 bars of white chocolate for $27.09, how can she determine the amount of money she has left to buy dark chocolate? On a dive, some oceanographers saw a humpback whale which was 13.7 m long, and a killer whale which was 6.85 m long. 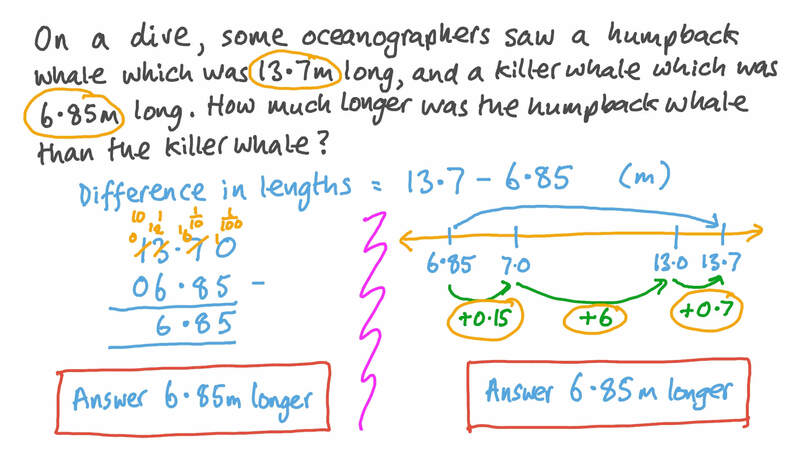 How much longer was the humpback whale than the killer whale? In 2014, the global circulation of National Geographic was about 6.8 million magazines; in the same year, Time had a global circulation of about 3.3 million magazines. What was the difference between the global circulations of the two magazines? The table shows the top three finishers in barrel racing at the Livestock Show and Rodeo. What is the difference in time between first and second place? The table shows the approximate populations of different countries in 2,017. How many times more people lived in China than in India in 2,017? 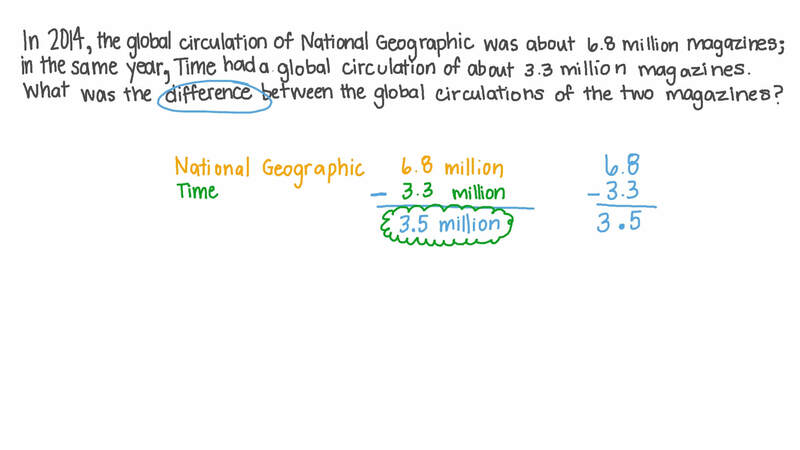 Round your answer to two decimal places if necessary. The table shows the numbers of Internet users in different countries in 2016. In 2016, how many times more Internet users were there in China than in India? Give your answer to the nearest tenth. Calculate the following: 8 7 . 6 − 8 . 2 9 . The table shows the top three times for the women’s 100-meter butterfly event at the 2004 Summer Olympics. What is the difference between Petria Thomas’ time and Otylia Jedrzejczak’s time? The given table shows the average lengths of a femur, tibia, and fibula for a group of adult males. On average, how much longer is a femur than a tibia? A woman bought some goods for 130.50 LE and sold them for 440.40 LE. How much profit did she make? A man had 70.93 LE. He spent 28.23 LE. How much money does he have left? The monthly salary of an employee is 568.41 LE. Last month he spent 432 LE of it. How much of it did he save? Round your answer to the nearest pound. 4 4 . 4 1 7 9 − 1 7 . 1 9 1 ≈ to the nearest thousandth.